Favorite Photos- learning the story. There are always a few family photos that bring larger smiles to your face when you look at them. This is one my mine. 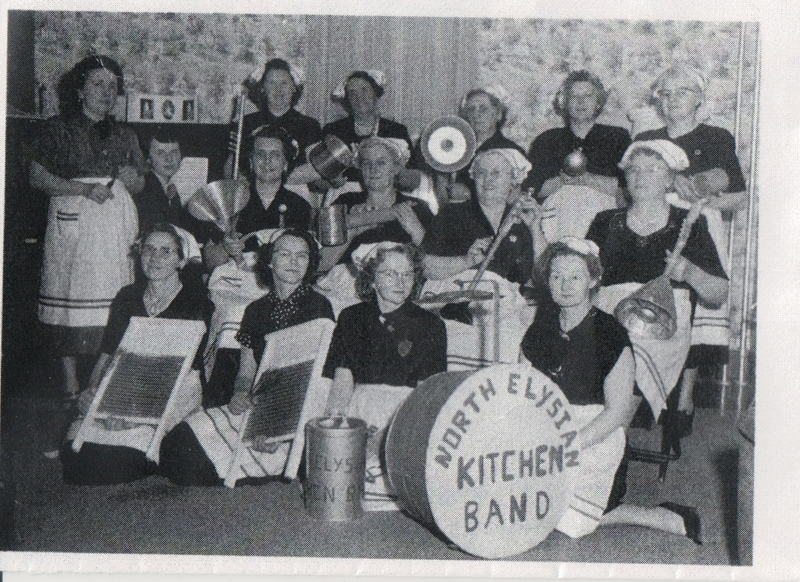 A photo of the North Elysian Kitchen Band. My Great-Grandmother is in the second row, 3rd from the right. I have been told that they had concerts and were even on t.v. at one time. What an unusual way for the women to get together and have fun! But was it unusual? I wanted to learn more about kitchen bands so…of course I turned to Google. It described how some of the instruments were put together. Since the design of each instrument was only limited by imagination – there were lots of varieties. But the article did describe how they would use kazoos in many of the instruments and attach them to other pieces to create different sounds. This helps me understand Grandma Morsching’s instrument that has a flour sifter at the end of something else. It also confirms my mother’s memory that it sounded a lot like kazoos. A Morsching Kitchen Band for an upcoming Family Reunion, could be a new event! Time to stock up on kazoos! Now if I could only locate a video of their appearance on a news program. That would be exciting. New Organization, New Conference – New Found Success!